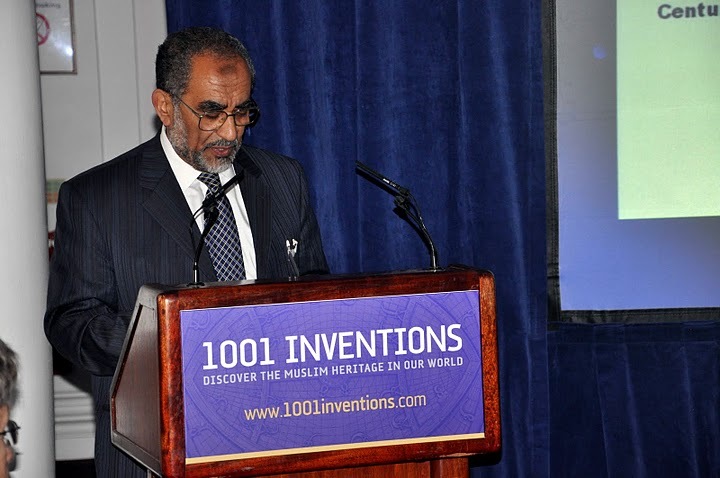 Presentations by Professor Rabie E. Abdel-Halim on behalf of FSTC in 2012. 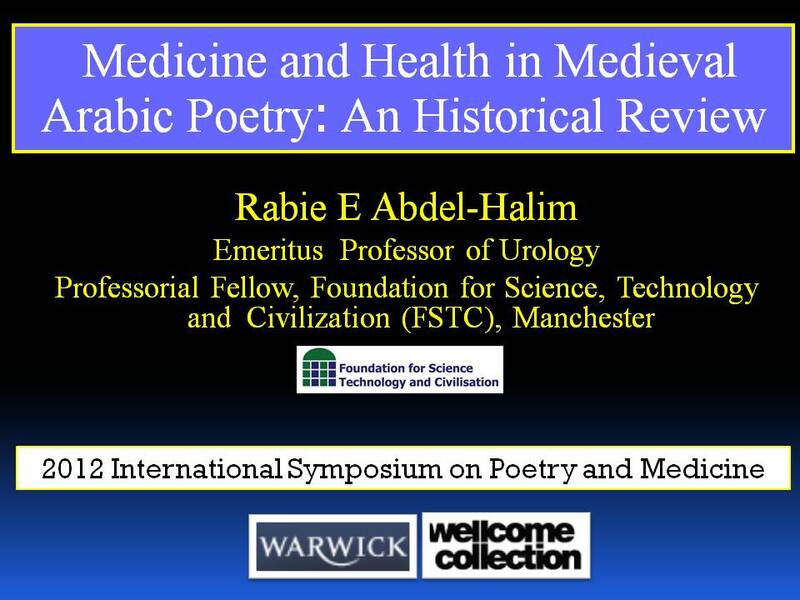 ‘Medicine and Health in Medieval Arabic Poetry: An Historical Review': an oral presentation on behalf of FSTC at the 2012 International Symposium on Poetry and Medicine organized by the Poetry and Medicine Initiative of the Institute of Clinical Sciences, Warwick Medical School and held at the Henry Wellcome Lecture Theatre, Wellcome Collection, Wellcome Institute, London on the 12th of May 2012. The opening slide of Professor Rabie E Abdel-Halim's presentation at the Wellcome Collection in May 2012. This review of medieval Arabic medical poetry is based on our study of the two major classical biographical encyclopaedias ‘Uyûn al-Anbâ' fî Tabaqât al- Atibbâ' (Essential Information on the Classes of Physicians) authored by the 13th-century scholar Ibn Abî Usaybi'a and Al-Shi'r wa-‘l-Shu'arâ' (Poetry and Poets) by the 9th-century writer Ibn Qutayba, in addition to several other primary medieval sources. Medically-related verses in all these sources are collected and classified. Illustrative examples of each category are translated. Pre-Islamic suspended odes survived to represent examples of the Arabs' mastery of poetry composing and reciting; poetry was their most celebrated literary genre. In addition to the eloquence and artistic value, they remain a reliable historical record of the social, political and cultural life of the time. A number of poems refer to health and illness with vivid descriptions of medical attention and treatments. After the advent of Islam, poetry reflected the new faith and its effect on the hearts as well as the minds of people, urging them to seek and increase their knowledge. The resulting intense scientific movement did not pose any conflict between the humanities and natural sciences. Together with the revival of various sciences during the Islamic Golden Age, a new theme of Arabic poetry flourished with the appearance of a tradition of didactic poems composed by medical scholars to be used in educating and training medical students. Meanwhile, Arabic poetry also dealt with ethical, social and humanitarian aspects of medical care. A guest lecture presented at the 2012 Conference on Intellectual Life in Early Muslim World: Past and Present organized by and held at the History Department of Manchester Metropolitan University, Manchester, Uk on the 13th of June 2012. The opening slide of Professor Rabie E Abdel-Halim's guest lecture at the History Department of Manchester Metropolitan University in June 2012. 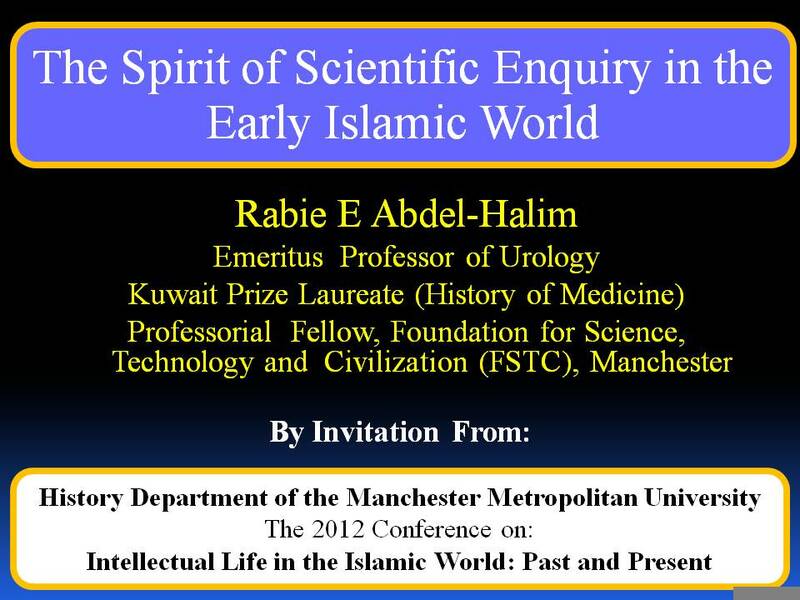 This lecture reviews and documents how the spirit of scientific enquiry started and developed during the early Islamic world with an emphasis on the very early beginnings, during the lifetime of the Prophet from the year 610 when the Quranic revelations started in Makkah, up to the year 622 the time of migration to Madinah, until the time of his death in the year 632. It was during that period, that the seeds of scientific enquiry were first sown. The Quran and the tradition of the Prophet (Sunnah) were the stimulus and inspiration for the spirit of scientific enquiry to develop in the hearts and minds of people and then to flourish and spread with the fast and vast spread of the new faith. Love for the search for knowledge, a call to think and contemplate in the whole universe around as well as discrediting intellectual stagnation and condemning blind imitation of the forefathers, were all factors that helped in launching a new era of scientific methodology that began in the time of the Prophet and continued to grow and yield fruits during the time of Rightly-Guided Caliphs, the Umayyad and then the Abbasid periods. The passion for truth and objectivity, the general respect for fully corroborated empirical evidence, and a mind skilled in the classification of things were some of the most outstanding features of early Muslim religious scholarship, as can clearly be seen in their studies of jurisprudence and its source methodology, as well as in the documentation of Prophetic traditions. This scientific attitude and scientific frame of mind lead to the early development of the scientific method that was soon applied to the study of natural sciences. Furthermore, the strong feeling of brotherhood-in-humanity that emanated in the hearts and minds of people from the teachings of Quran and Sunnah helped to establish tolerance, open mindedness and friendly ties between Muslims and non Muslims in the lands to which Islam spread. 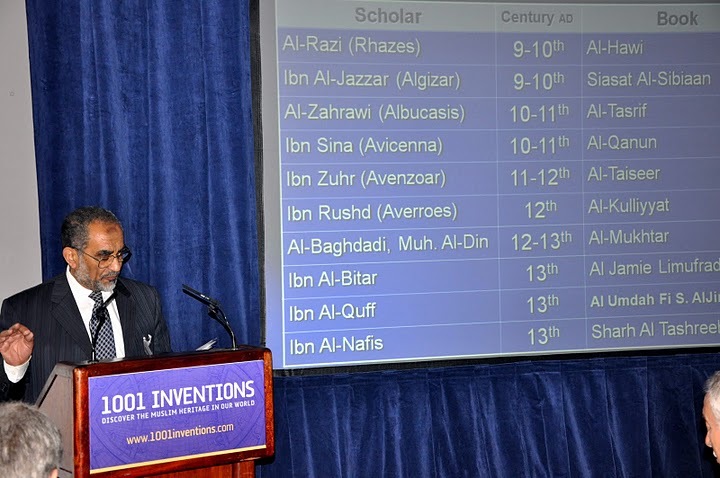 This gave a boost to the spirit of scientific enquiry and interchange of knowledge in the early Islamic World. It helped also in the process of preserving the remaining literature of all previous civilizations being a heritage for all mankind. This lecture was entitled "The Use of Arabic Poetry in the Teaching of Medical Humanities at Medical Colleges" and presented at the conference on Madrasah Tradition and Madrasahs in the Process of Modernization organized by and held at the Faculty of Theology, Alp Arslan University, Mus, Turkey on the 5-7th of October 2012. The presentation was in Arabic. Mus Alp Arslan University Website: www.alparslan.edu.tr. The lecture highlighted the modern trend of realizing the significance of the spiritual element of human nature; hence the need to give more emphasis to the study of humanities disciplines such as history of medicine, ethics, religion, philosophy, medically related poetry, literature, arts and medical sociology in medical colleges, with the aim of allowing graduates to reach to the heart of human learning about meaning of life and death and to become kinder, more reflective practitioners. The medicine taught and practiced during the Islamic civilization era was a vivid example of the unity of the two components of medical knowledge: natural sciences and humanities. This historical fact formed the foundation for designing a course on medically-related Arabic poetry to be taught for undergraduate medical students in Arab countries. The aims, objectives and teaching methods used in the course were outlined. Furthermore, examples of various medically relevant poems were given including poetry by patients describing their sufferings, aging patients portraying their senility as well as poetry by patient-relatives and by doctors. Furthermore, some examples of using poetry in medical and health education were given. In that way, the course provides in a poetic and impressive way some practical examples of medical ethical encounters as well as data on sociology, philosophy and history of medicine. It will also teach students to reflect on broader questions about the healthcare system and their place in it. This reflective practice will enhance notions of self-awareness and greater insight into one's own personal values and assumptions. The opening slide of Professor Rabie E Abdel-Halim's presentation at the Faculty of Theology, Mus Alp Arslan University, Mus, Turkey in October 2012. Science in Arabic Poetry: FSTC Explores a New Face of Muslim Heritage: See Article by Prof. Rabie Abdel-Halim (in Arabic) .